Carbonara is about three things: pancetta, Parmigiano Reggiano and freshly cracked pepper. This being said, it’s SO important to keep your ingredients high quality. Be discerning when choosing the pancetta and Parmigiano Reggiano. Pancetta is cured Italian pork belly. It’s seasoned with salt and pepper then rolled and cured in a circular shape. Unlike bacon, it isn’t smoked. 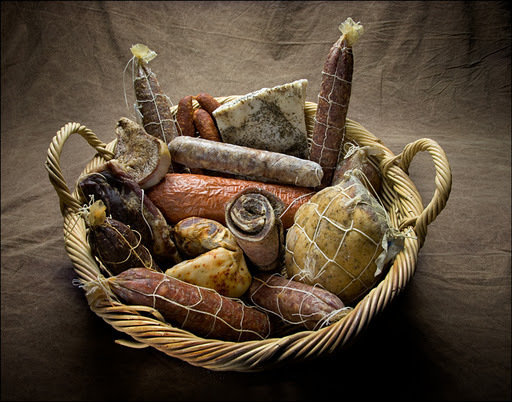 Look to local butchers or salumias for the most unique and flavorful products. Parmigiano Reggiano is a special breed of cheese. Why, you might ask, don’t I just call it “parmesan”? Actual Parmigiano Reggiano is made exclusively in the Provinces of Bologna, Mantova, Modena, Parma and Reggio nell’Emilia. This product is made in strict ordnance with the Consortium and guaranteed for over 70 years. A highly concentrated cheese, it contains 70% nutrients, 30% water, and is always 100% natural; it’s been loved for over 900 years. Any type of Parmesan not made by these strict standards, specific dairies and designated Provinces, is called simply “Parmesan”. It’s the same idea as Champagne vs. Prosecco. It might be similar, but not the same. Buy a small chunk and use a microplane to make feathery pillows of salty, cheesy goodness. Pepper: ALWAYS grind your own from a pepper mill. Period. The end result is overwhelmingly better and honestly, it’s a waste of time to use anything pre-ground. I’m quite open when it comes to the pasta shape. I really like a shell or similar option because the little pieces of pancetta get caught inside, like a little pork surprise! It’s also delicious with fresh linguine; experiment to your tastes, just make sure you cook the pasta to al’dente (just shy of ‘done’). Pull the pasta about a minute before you think it’s cooked. Interesting fact: the less pasta is cooked, the lower it is on the Glycemic Index. This means an al’dente pasta takes longer ot digest so you’ll have less spike in blood sugar.